By installing Doro PDF Writer on your Windows-based system, you will be quickly creating a virtual printer driver which creates PDF files from the print function of virtually any program which has printing capabilities. Whether it be a web page, a Word document or an Excel spreadsheet, Doro PDF Writer will create the PDF file with very little fuss... just using the "Print" function and select the Doro PDF Writer. 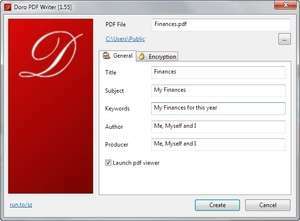 In addition to creating basic PDF files, Doro can also encrypt them by adding password protection. For security reasons, you should also check out the Doro PDF Writer download at LO4D.com which includes virus and malware tests. Additional screenshots of this application download may be available, too.